pressed regardless of the position of the ignition key. on the cluster come on. Press the switch again to turn the lights off. lights it is necessary to have the side/taillights switched on and warning light on the cluster come on. Press the button again to turn these lights off. light it is necessary to have the dipped beam headlights switched onand warning light on the cluster come on. device is automatically switched off after about 20 minutes. lights is governed by the Road Traffic Code of the country you are in. Keep to the rules. It is located under the dashboard on the front right-hand door pillar and it comes into operation in the case of an accident to block the supply of fuel thereby stopping the engine. Carefully inspect the car to find fuel leaks, e.g. in the engine compartment, under the car or near the tank. If no fuel leaks are found and the car can be started again, press button (A) to reset the fuel system and the lights. After a crash, remember to turn the ignition key to STOP to prevent battery run-down. 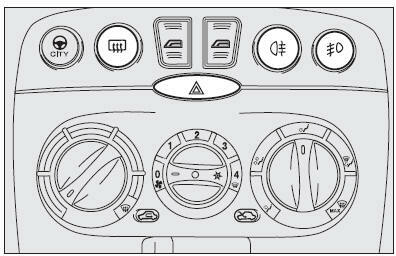 smell fuel or see leaks from the fuel system, do not reset the switch to avoid fire risk.